Just a quick post to point out Stephen Colbert's awesome response to the news that Chinese scientists have successfully inserted the human breast milk gene into a cow embryo and then implanted it into a surrogate cow. There are now over 300 of these cows living on a farm in suburban Beijing. This cow-surrogate human breast milk is 80% the same as human breast milk, according to the project's director and lead researcher Li Ning. It could replace baby formula in China within three years. I'm worried about the health risk for the cows and I'm wary of genetic modification in general. Colbert's response? First, feigned nausea. Then: "Science, stop trying to reverse the normal order of things! 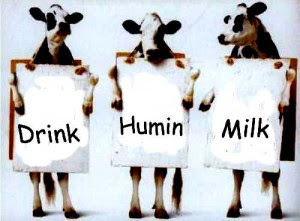 We aren't supposed to drink human milk! We're supposed to drink the emulsion of fat globules secreted from domesticated cattle that are artificially inseminated, hooked up to an industrial-strength vacuum, and forced to lactate nonstop. Mmmm! My taste-buds are lactating nonstop." Oh, those Chik-fil-A cows make me lose my appetite everytime I see them. I guess we aren't supposed to think of their sandwiches as chickens when they show us burgers are cows. Not too swift of an advertising campaign! Chick-fil-A's support of anti-gay-rights politics also makes it easy to pass up. Unfortunately if their sweet potato waffle fries go national, I might be tempted to give in once in awhile. Colbert is awesome. He left out that the cows are fed corn, right? I know you're put off by milk, but at least in Wisconsin I could get grass-fed milk and it was so delicious, you can tell doing things closer to nature's way is naturally so much better. I need to get over to Whole Foods and see what they have now that I live in Austin. I wish I didn't love milk so much. And dislike soy, almond and coconut milk so much. Is there a coconut milk that tastes like coconut? I tried one variety of So Delicious and was disappointed it had no coconut taste, I wanted to use it in chai tea. Austin Atheist: are you drinking actual coconut milk or coconut-flavored "drink"? I recently discovered there's a difference. And I wouldn't feel guilty if I were you - seeking out grass-fed, humane cow's milk is an awesome idea. Ah yes, I see it says COCONUT MILK! in big letters and then in teeny letters underneath "beverage".